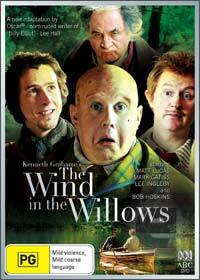 The classic novel, Wind in the Willows once again receives a makeover that was filmed in Romania for the BBC and stars Britain's very own funny man, Matt Lucas (Little Britain) as Mr. Toad in this entertaining 21st century remake. Starring Mark Gattis as Ratty, Lee Ingleby as Mole, Bob Hoskins as Badger and Imedla Staunton as the Barge Lady, this interesting remake relies on the stars to tell the tale of this children's classic. Set in the beautiful countryside of Romania, the series involves Mr. Toad who has become smitten with cars, much to the amazement of his friends and family who find his behaviour extremely puzzling. To compound the situation, the weasels are up to no good and it's time to Mr. Toad to step up to the plate and retake Toad Hall. Director Rachel Talalay does a brilliant job at directing this tale with the star of the movie being Matt Lucas as he portrays this strange version of Mr. Toad with his bald head and hysterical laugh. The movie has its moment, most involving Matt Lucas and is a rather entertaining remake that I'm sure both kids and adults will enjoy. Definitely worth investigating. Director Rachel Talalay has brought an extremely low-tech approach to the material, with nothing more than a prosthetic nose or exaggerated eyebrows to designate the characters' animal correlation. This is especially bold in the personage of Toad, who with his bald head and maniacal laugh plays like a cross between Humpty-Dumpty and Uncle Fester -- periodically bursting into catchy little songs, which Lucas belts out with the same infectious gusto he brings to the role in general.